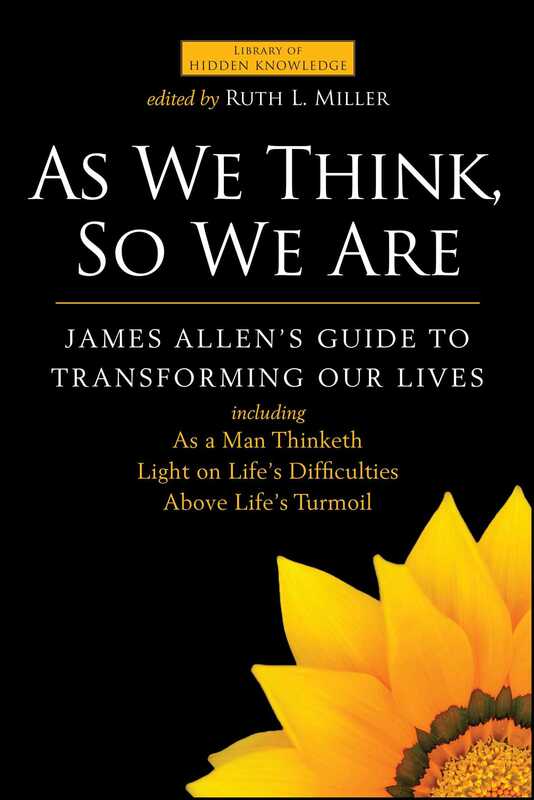 As We Think, So We Are, the fifth book in the Library of Hidden Knowledge, invites readers to explore the pioneering teachings of James Allen, one of the first leaders of the self-help movement. Dr. Ruth Miller offers modern translations of three of Allen’s most insightful essays. Using clear, concise language paired with practical applications, Miller creates an accessible way to delve into and explore the fundamental processes that determine how we interact with—and understand—the world. This reading group guide for As We Think So We Are includes an introduction, discussion questions, and ideas for enhancing your book club. The suggested questions are intended to help your reading group find new and interesting angles and topics for your discussion. We hope that these ideas will enrich your conversation and increase your enjoyment of the book. James Allen was a young man who loved to read. After he read and reread the complete works of Shakespeare, he discovered two books that changed his life forever. The first book was Ralph Waldo Emerson’s little set of essays called Nature, (which Dr. Ruth Miller updated in the first chapter of the Library of Hidden Knowledge book Natural Abundance). The second was a long poem by a man named Edwin Arnold called The Light of Asia, which was a fictionalized version of the Buddha’s life (similar to a 19th century version of Siddhartha). When he had consumed both of those and considered them in the light of his Christian background, he realized there was a simple message in them that we could all benefit from, he called it As A Man Thinketh. It was incredibly popular from the start, selling thousands of copies all over the world in many different languages—a much harder feat in 1912 than in 2012! Dr. Miller has brought this gem of a book into the 21st century, with references to other spiritual traditions, modern examples and language, and no gender bias. She’s added pieces from two of his other books to give us a fuller sense of how Allen thought we could change our experiences by changing the way our mind works. 1. The opening line to Book One is: “Mind is the master power that molds and makes…” This is the essential message of the whole book, as well as of Ernest Holmes’ Science of Mind. What does this message mean to you? What is mind? Is he talking about our own individual mind or some cosmic, divine mind? Does it make a difference which? How can it be that the mind molds or makes the material world around us? 2. A little later he says, “We are the makers of ourselves by virtue of the thoughts we choose and encourage.” How can that be? Aren’t we “as God created us?” What does he mean by “makers of ourselves?” If you’ve read A Course in Miracles you may recall the distinction made there between the small-self/ego “making” material things and God/Source “creating” eternal qualities. How does this concept relate to what Allen is saying? 3. How does the law of cause and effect apply to our lives? How does it relate to “as ye sow, so shall ye reap?” To Karma? Can we overcome them? How? Can you think of an example where you “reaped what you sowed?” Can you think of someone who overcame this principle? How? 4. What is the reason for misery? Is it our external circumstances? Is there someone out there we can blame for the times we feel miserable? If you think of a time when you felt miserable or of a person who’s been feeling miserable, what is causing the misery? Is it something that’s happening right now? Something in the past? Something that might occur in the future? 5. How is tending our mind like tending a garden? What are some of the “weeds” you’d like to remove? What are some of the “flowers” and “fruits” you’d like to encourage? 6. Allen says our body shows what we’ve been thinking. Does this apply to you? To your parents? Are there people in your life that you know, simply by looking at them, what their normal thought processes are? 7. One of the most famous lines from Allen’s book is, “All that we achieve and all that we fail to achieve is the direct result of our own thoughts.” Can you see how that might be so? What kinds of thoughts lead to achievement? What kind lead to failure? Right now, what would you like to achieve? Are you thinking thoughts that support that? What would you change? Why? 8. How is the light of wisdom like turning on a lamp in a dark room? What are the ideas we bump up against, over and over, when we don’t understand how our minds rule our experience? Can you think of an example in your own life, a pattern that you’ve repeated over and over because you can’t stop thinking or acting a particular way? Where can you go to find a solution? 9. Allen says that, “Aspiration, meditation, and devotion are the primary means that people in all ages have employed to reach higher modes of thought, more profound levels of peace, and vaster realms of knowledge.” What does this mean? What do you aspire to? Do you meditate? What, or who, is worth being devoted to? How can doing these three things lift us out of normal thought and stress? 10. Allen goes beyond suggesting that we change our personal lives. In the section titled “Rising Above” he also says, “If you would have the world emancipated from misery and suffering, then emancipate yourself. If you want your home and your surroundings to be happy, then be happy. You can transform everything around you if you simply transform yourself.” How can this be? How will the things around us change if we change our thoughts and words and actions? How much of it is because they’re reacting to changes in us? How much is because we’re all interconnected and you can never change a part without affecting the whole? 11. How does Allen distinguish between mortality and immortality? Is it possible for us to become immortal? How is that different from reincarnation? From extending our current situation out forever? Would you like to be immortal? Why or why not? 12. Most of us have been taught that there is a power at work in the world called “evil.” Yet the science of metaphysics says, “There is only one Power and one Presence, God the Good…” How do you reconcile your experience of evil with that teaching? Now notice what Allen says, “When they find out that their own resentment is all that must be eradicated and begin to put love in its place, the appearance of evil will dissolve for lack of sustenance.” Does that make sense to you? Does it feel empowering? 1. Watch the “Doctor Quantum” segment of the DVD, Further Down the Rabbit Hole, especially the part called “The Double-Slit Experiment”. 2. Watch the “Psychokinesis” segment of the DVD Something Unknown to see how each of us, and all of us together, affect the shape and activity of matter. 3. Watch the “How Thoughts Affect Water” segment of the DVD Messages from Water to see what thought and prayer do to the structure of water. 4. Practice meditating together. The simplest form of meditation is simply to close your eyes, relax your body in a comfortable position, and breathe normally, saying a powerful word like “peace”, or “one”, or “God”, or “Om” on the exhale. Do so together for 20-30 minutes, perhaps with some soft, non-vocal music in the background. (The CD 7 Metals is also very effective.) As the mind wanders, just bring your attention back to your breathing and the word. Afterward, talk about the experience. 5. Watch the film Centennial Man with Robin Williams and talk about why he chose to become “mortal”. Then, watch What Dreams May Come, also with Robin Williams. Is that immortality? Explore together how the thoughts and images he focused on early in the film affected his later experience. Then talk about how his “mentor” first appeared while Robin Williams’ character was still confused. Is it possible there’s something more? 6. Take up the 28-day challenge to replace the “10 Sorrow-Producing Thoughts” with the “10 Divine Qualities” described on pages 180-183 of the book. Check with each other each time you meet to see where you are in the process and how your life is changing as a result. Born in 1864 in England, James Allen took his first job at fifteen to support his family. Allen worked as a factory knitter and later a private secretary before writing his first book, From Poverty to Power, in 1901. In 1903 he completed his best-known work: As a Man Thinketh. Allen wrote nineteen books, including his spiritual journal, The Light of Reason, before he died at age forty-seven in 1912. While not widely known during his lifetime, Allen later came to be seen as a pioneer of contemporary inspirational literature.